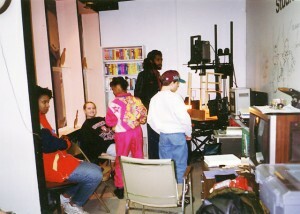 Children’s Media Digitization Project is an effort to preserve student work created in the media programs at Capital Children’s Museum in Washington, D.C.
David Cook and Chuck Jones in the Animation Lab. Former director of Media Arts at CCM, Christopher Grotke is digitizing old videotaped work and uploading files to the Internet Archive. It’s a labor of love, done in free time, to save some great animation and video projects spanning the mid 1980’s through the early 2000’s. So far, 1987-1996 U-matic tapes have been converted and uploaded. Please consider a donation to this project to help compensate for the time and effort, and to help get all of these important projects preserved and archived. Here are the projects available to date. We’re digitizing and uploading the 3/4″ U-matic video tapes first, then VHS tapes, then Betacam tapes. Animation at Capital Children’s Museum begins. Projects shot on 16mm film and transferred to 3/4″ umatic. Projects are shot using 8mm videocameras and transferred to 3/4″ umatic. 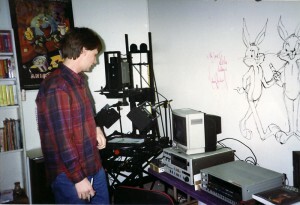 The Animation Lab opens, and most projects now shot on an animation stand directly to 3/4″ tape using a single frame controller. Animation Lab at CCM. 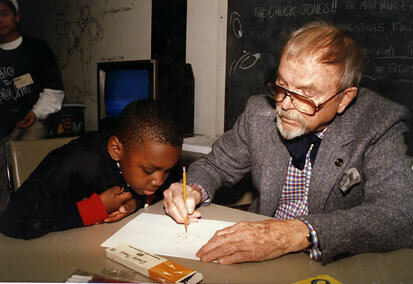 Chuck Jones drew Bugs Bunny (“Whatcha shooting, Doc? Not rabbits, I hope”). The red text says “With love to all the children, Michael Jackson.” He was convinced to sign the wall after being reminded that he had been an animated character in cartoons and videos. Student projects take off, and special guests make visits. More sophisticated use of the animation stand, lighting, and styles of animation are evident. Class projects, stories, and music videos. Flipbooks, pencil tests, and full productions. Seems like an experimental year. T. Carlos Williams works with Kris, Enderlee, and others. Note his multiplane rig on the animation stand. Work with the public, and pencil tests. Clay animation and mixed media. More projects will be added as they are converted and uploaded. You can contribute to help fund the process.